All children are entitled to be safe, healthy, nurtured and valued. Foothills Child Advocacy Center envisions a unified and just community whose members are knowledgeable about and invested in assuring that all child victims receive the benefit of a range of services available in the community. Foothills Child Advocacy Center provides a coordinated system of effective response and intervention to children who have been victimized. Our goals are to minimize trauma, promote healing, and ensure child safety. ​Foothills Child Advocacy Center recognizes, honors, and promotes diversity in race, color, ethnicity, national origin, language, cultural background, religion, creed, age, gender, gender identity, sexual orientation, cognitive ability, educational level, disability, military service, socioeconomic status, neighborhood (including proximity to and awareness of services), and history of abuse. We seek to reflect this diversity and ensure equal opportunity and inclusion in all aspects of our work, including the composition of our board, committees, staff, and volunteers. Further, we seek to be a culturally competent organization, governed by an attitude of cultural humility, so that the children and families we serve do not have to struggle through barriers such as language and culturally biased values or expectations to get the services and support they need. Educate our community about child abuse. Download our brochure to learn more about Foothills. Foothills Child Advocacy Center Current and Former Board Members. 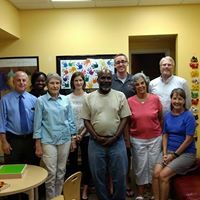 Left to right: Dr. Mark Mendelsohn, Abigail Osei (former), Bettie Kienast (former), Dr. Amy Wrentmore (former), Melvin Wilson, Ph.D., Bill Click, Judy Randle, Andy Sullivan, and Kathy Ralston. (Not pictured, Lisa Brook, Carl Brown, Dr. Jocelyn Schauer, and Mary Sullivan.) June 2017. ​In October 2011, Foothills Child Advocacy Center became an accredited member of the National Children's Alliance. In January 2017, Foothills earned re-accreditation, after an intensive review process. ​What does that mean? By meeting national accreditation standards, Foothills Child Advocacy Center is recognized as having achieved a level of multidisciplinary collaboration and coordinated service delivery that significantly improves the experience and well-being of children who are subject to child abuse intervention. This accreditation provides great value and credibility to our community’s child advocacy center. Click here to learn more about the history of Foothills and other child advocacy centers.